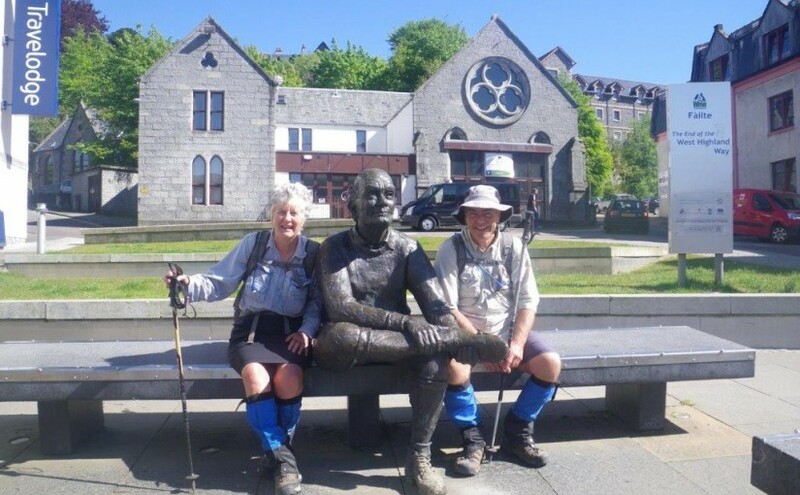 The end of the West Highland Way is marked by a statue of a man with sore feet, and that’s a pretty accurate description of how we are feeling after our 25km walk today. 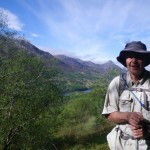 As soon as we left Kinlochleven the path climbed steeply uphill on the old military road. 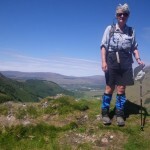 We stopped for a breather near the top and looked back at the way we had come. 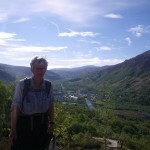 In the photo of Felicity you can see the penstocks leading down from the hydro dam, which we walked beside yesterday. 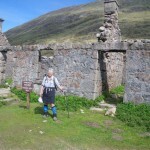 At the top of the hill we entered the Lairigmor, a wide glen between two ranges of hills. There were several ruined houses along the way from when farmers used to live up here, recently enough for one of them to have left his car behind. The rusty pile of metal beside me in photo 3 probably isn’t very recognisable as a car. 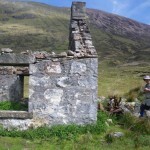 I didn’t mention in my report about the massacre of Glen Coe that the perpetrators were Felicity’s ancestors the Campbells. A generation before, in 1645, the MacDonald Clan had defeated their rivals in the battle of Inverlochy near Fort William. They pursued the wounded Campbell fighters up into Lairigmor, and erected a standing stone to mark the spot where they abandoned the chase. 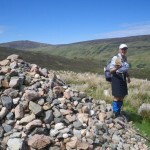 Nowadays there is a large cairn, and the tradition is that passing MacDonalds add a stone while passing Campbells remove one. Felicity took a tiny one for a souvenir, and threw another large one away. We stopped for lunch at a spot overlooking Lochan Lunn Da-Bhra, the home of a mythical bull who used to lure away the crofter’s cattle. The tiny island in the lake is supposed to have been the home of Macbeth, king of Scotland. The Way leaves the military road at this point and heads uphill into the forest. It wasn’t long before we caught our first view of the snow-topped Ben Nevis, Britain’s highest mountain. 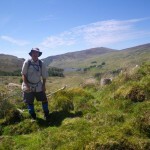 A few miles later we made a detour up to the top of a hill to inspect an Iron Age fort. 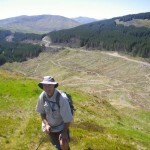 If Maori had lived in this area this would have been a Pa site – the views in all directions are spectacular and it would have been easy to see enemies coming. The top of the hill was once surrounded by a rock barricade, but about 2000 years ago they must have let their guard down because the fort was destroyed by fire. The heat was so great that the rocks were vitrified (melted into a glassy mass). Felicity made another panorama from this spot. From here the Way headed down and down on a forestry road. 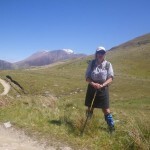 Eventually we reached the town, but we still had quite a way to walk along hard footpaths which is why our feet are sore. We passed a massive boulder called Clach Comhairle which according to legend once a year dispenses wise advice and turns around three times. Today was not the day. The original end of the Way is at a large roundabout at the Nevis Bridge, but recently the large Travelodge chain agreed to build in the town on the condition that the Way be extended to end outside, in the town centre. We had to go there anyway to find our accommodation, so it wasn’t a problem. 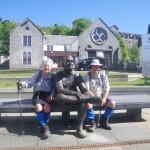 We recruited a fellow walker to take the obligatory photo posed beside the statue.